The aim of this study was to examine the association between the consumption of total and specific types of dairy products and the risk of incident cataracts in an elderly Mediterranean population at high cardiovascular risk. We prospectively analyzed 5860 subjects from the PREvención con DIeta MEDiterránea (PREDIMED) Study. The time to cataract surgery was calculated as the time between recruitment and the date of the surgery, last visit of the follow-up, date of death, or until the end of the study. Dairy products intake was assessed using validated food frequency questionnaires. We used Cox proportional hazard regression to assess the risk of cataract surgery according to average dietary energy-adjusted total dairy products, milk, yogurt and cheese consumption. We documented a total of 768 new cataract events after a median of 5.6 years of follow-up. Subjects in the second [hazard ratio (HR) 0.62; 95% CI 0.52, 0.74] and third tertile (HR: 0.71; 95% CI 0.60, 0.85) of skimmed yogurt intake had a significantly lower risk of cataracts after adjusting for potential confounders. No significant associations were observed for total dairy products, whole and skimmed milk, whole yogurt and cheese consumption. 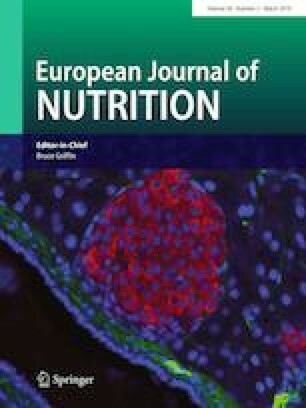 The intake of skimmed yogurt was associated with a reduced risk of cataracts in an elderly Mediterranean population with high cardiovascular risk. No significant associations were observed for other type of dairy product. International Standard Randomized Controlled Trial Number (ISRCTN): 35739639. Registration date: 5 October 2005. The online version of this article ( https://doi.org/10.1007/s00394-018-1647-8) contains supplementary material, which is available to authorized users. The supplemental foods used in the study were generously donated by Patrimonio Comunal Olivarero and Hojiblanca, Spain (Extra Virgen Olive Oil); the California Walnut Commission, Sacramento, California (walnuts); and Borges SA (almonds) and La Morella Nuts (hazelnuts), both from Reus, Spain. The PREDIMED trial was supported by the oficial funding agency for biomedical research of the Spanish government (Instituto de Salud Carlos III) through grants provided to research networks specifically developed for the trial: RTIC G03/140 and RTIC RD 06/0045. Lucía Camacho-Barcia is the recipient of a pre-doctoral fellowship from the Generalitat de Catalunya’s Department of Universities (FI-DGR 2017). All investigators of the PREDIMED trial belong to ‘Centro de Investigación Biomédica en Red’ (CIBER), an initiative of Instituto de Salud Carlos III. MB had full access to all the data in the study and takes responsibility for the integrity of the data and the accuracy of the data analysis. MB, MAMG, DC, RE, MF, EGG, FA, MF, JMSL, LSM, XP, JB, ET, MAM, VZM, JSS: contributed to the conception, design, and implementation of the project; AGL: was a member of the outcome adjudication committee; LCB, MB, JFGG contributed to data collection and analytical procedures; LCB and MB: conducted the statistical analysis, interpreted data, and wrote the manuscript; and all authors: read and approved the final version of the manuscript. We thank all the participants in the trial for their enthusiastic and continuous collaboration. The funding sources had no role in the design and conduct of the study; collection, management, analysis, and interpretation of the data; preparation, review, or approval of the manuscript; and decision to submit the manuscript for publication. JS-S reports personal fees from Nuts for Life, other from Nut and Dried Fruit Foundation, other from Nut and Dried Fruit Foundation, during the conduct of the study; personal fees from Danone S.A., personal fees from Font Vella Lanjaron, personal fees from Eroski Distributors and personal fees from Instituto Danone, outside the submitted work. None of the other authors had a personal or financial conflict of interest.